Northern Hot Tub Covers is one of Canada’s leading suppliers of Replacement Catalina Spas Hot Tub Covers. We have all Catalina Spas Hot Tub models on file in our extensive measurement database perfected over years of making hot tub covers in Canada. 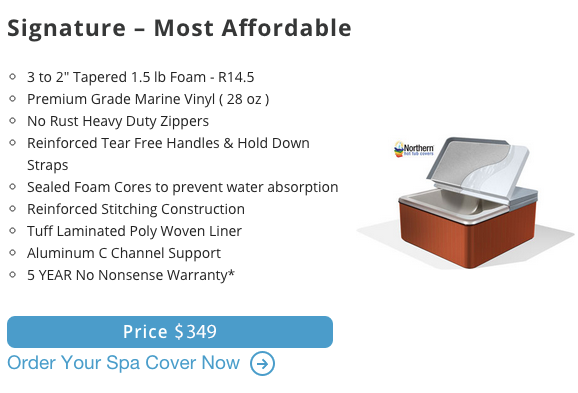 Northern Hot Tub Covers are your spa cover specialists and will replace your Catalina Spas hot tub with a perfectly fit, energy efficient, durable hot tub cover every time and is guaranteed to perform better than the factory original. Looking for a new Catalina Spas Hot Tub Cover we have made them all. Ordering a New Catalina Spas Cover has never been easier! What makes Northern Hot Tub Covers the Best ? 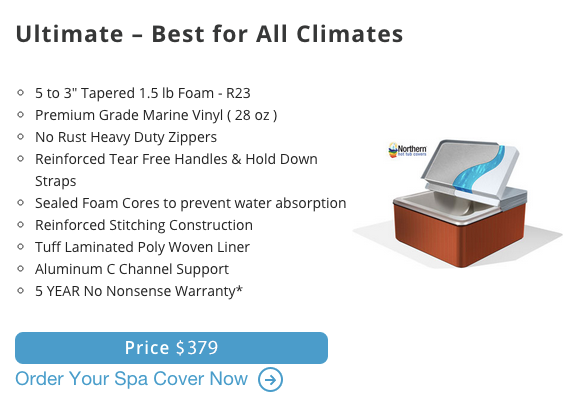 Our Hot Tub Covers use current technology to make them one of the best hot tub covers available. Using computerize cutting tables and current software allows us to make a spa cover that fits your hot tub perfectly every time. All of our hot tub covers are made with virgin 28 oz marine grade UV protect vinyl. For superior support all covers come with C-Channel reinforcement and extra heavy duty locking straps and handles with no charge hardware. All spa covers have no rust heavy duty zippers and reinforced stitching. We offer the option to double wrap the vapor barrier for additional protection of the Sealed Tapered Foam Cores. All hot tub covers may opt to add a full continuous hinge seal to capture escaping steam. We offer 4 different thickness of EPS Tapered Foam Cores depending on your climate or need. For Indoor spa covers we have the Signature Hot Tub Cover which features a 3"x 2" tapered foam and light weight up to the Ultimate II Hot Tub Cover 6" X 4" taper for heavy snow loads and colder climates. We are also pioneered the original EzShield Value Package which includes the Chemical Resistant PE Liner. All this backed by industry leading 5 Year Warranty, 5 Star Reviews, Free Shipping and the Number # 1 Customer Service in the Industry!